A four-tier security apparatus has been put in place for PM Modi's visit. Narendra Modi in J&K LIVE: I pay my tribute to martyr Nazir Ahmad Wani & all other brave soldiers who sacrificed themselves to protect the nation and maintain peace. Nazir Ahmad Wani was awarded Ashok Chakra. Youth like him show the youth of J&K and the entire country to live for the nation, said PM Modi. 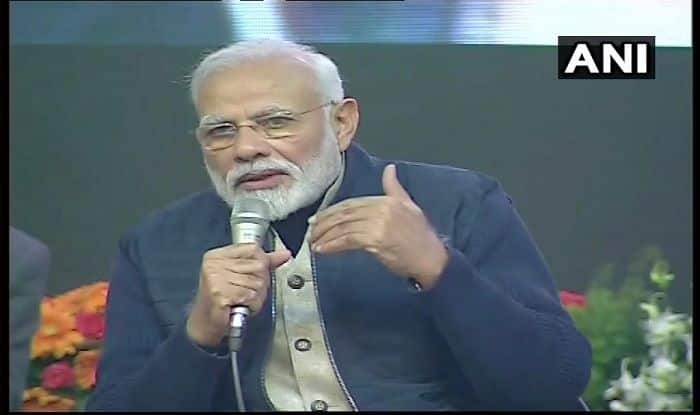 Narendra Modi in J&K LIVE: Prime Minister Narendra Modi interacts with college students across the country, from Srinagar. Narendra Modi in J&K LIVE: Prime Minister Narendra Modi inaugurates several development projects in Jammu. New Delhi: In the wake of PM Narendra Modi’s visit to Jammu and Kashmir, authorities have suspended mobile internet services in Srinagar on Sunday. “Internet services have been temporarily stopped in your area,” the residents of Srinagar awoke to this message from various service providers. Notably PM Modi is scheduled to visit Jammu and Kashmir today to begin the BJP’s Lok Sabha election campaign. In addition to this, he will lay the foundation or inaugurate various development projects, including two All India Institutes of Medical Sciences (AIIMS) in Jammu and Srinagar divisions and the University of Ladakh. He will also visit the famous Dal lake in Srinagar during his visit to the state. A four-tier security apparatus has been put in place for PM Modi’s visit. “We have made all necessary security arrangements,” a senior police officer told news agency PTI. Vigil has also been tightened along the border in view of the visit. The prime minister will also digitally launch various projects under the Rashtriya Uchchatar Shiksha Abhiyan (RUSA). He will unveil plaques via video-conference to lay foundation stones of 54 new model degree colleges, 11 professional colleges and one women’s university in the country. He will also inaugurate 16 model degree colleges, and 66 entrepreneurship, innovation and career hubs in the country. Besides, he will lay the foundation stones of three model degree colleges in Kishtwar, Kupwara and Baramulla in Jammu and Kashmir. He will lay the foundation stone of 624-MW Kiru hydroelectric project in Kishtwar. It is a run-of-the-river project across the Chenab. He will also inaugurate the 9-MW Dah hydroelectric project. Located in Dah near village Datang, this project is a run-of-the-river scheme. Modi will dedicate to the nation the 220-KV Srinagar-Alusteng-Drass-Kargil-Leh transmission system. The foundation stone of this prestigious project was laid by Modi in August 2014. The 400-KV D/C Jalandhar-Samba-Rajouri-Shopian-Amargarh (Sopore) transmission line will also be dedicated to the nation by Modi. The project has augmented the grid connectivity in Jammu and Kashmir. The prime minister will lay the foundation stone of 1,640-metre span double-lane bridge over the Chenab river in Sajwal. The project will provide an alternative route for the population of Sajwal and Indri Pattian. With the completion of this bridge, the distance between Sajwal and Indri Pattian will be reduced to 5 km from 47 km earlier, the statement said. Under the central government’s Saubhagya Scheme, the Prime Minister is also expected to declare 100-per cent electrification of households in Jammu and Kashmir. Earlier, the Prime Minister had visited Jammu, Srinagar and Leh on May 19, 2018.